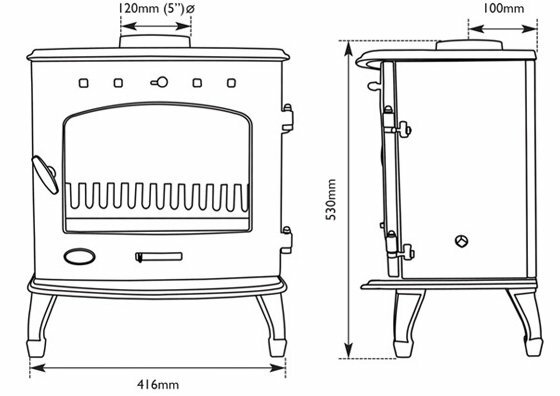 Owning a Carron 4.7 stove is an efficient and clean way to enjoy the pleasures of solid fuel, bringing a real warmth and character to its surroundings. Constructed from solid cast-iron yet retaining a contemporary aesthetic, the Carron 4.7 is very efficient with a rating of over 76%, the Carron 4.7 multifuel stove as with all Carron stoves has been approved by DEFRA for burning wood in smoke control areas. The Airwash system keeps your ceramic glass clean and clear from sooty deposits. It achieves this by directing an air current down over the inside of the glass from above, effectively creating a barrier or cushion between the glass and the particulate emissions of the fire. Thanks to this state-of-the-art system you can enjoy your view of the dancing flames unspoilt.